Austin Theriault of Fort Kent poses with the championship trophy after winning the ARCA Racing Series 2017 season title. 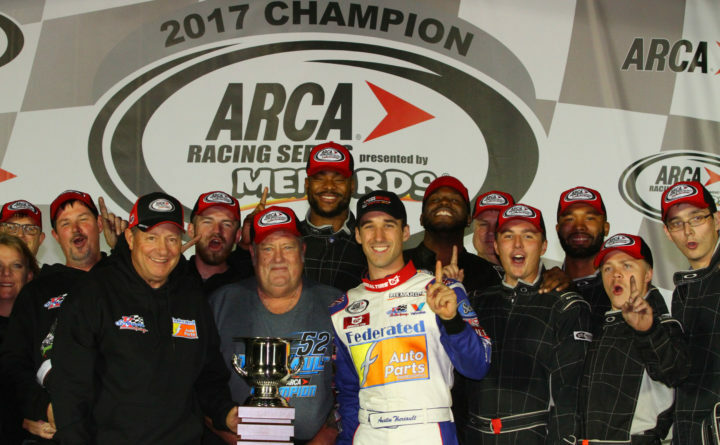 Austin Theriault of Fort Kent poses with his team after they claimed the ARCA Racing Series title, culminating with last Friday's race at Kansas City. Austin Theriault makes his way around the track during the Kansas 150 last Friday. 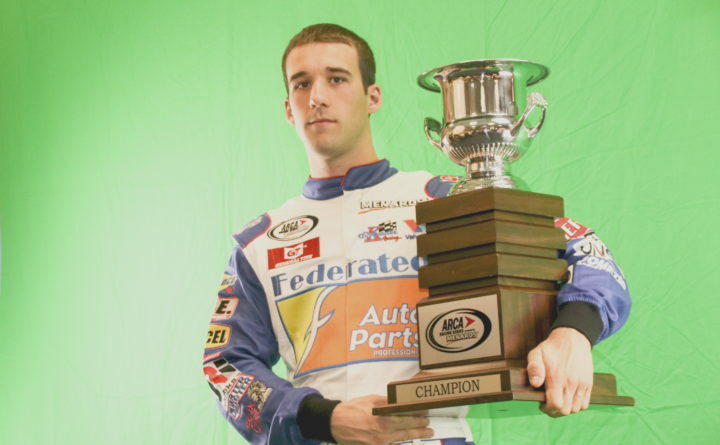 The Fort Kent driver won the ARCA Racing Series season championship. Austin Theriault’s car blew a tire in Friday night’s final ARCA Racing Series race, the Kansas 150, and he didn’t finish the race. He wound up 25th. That result didn’t matter as the Fort Kent native had already claimed the points championship with a remarkable season for Ken Schrader Racing. Theriault registered a series-best seven wins and 19 top-10 finishes in 20 races. That includes 12 top-threes with seven in a row leading up to the final race. “It is a huge accomplishment, obviously,” said the 23-year-old Theriault on Monday. “This isn’t just for me. We have all been in this together from the start. We didn’t give up through the challenges and I’m grateful for our success. The consistency we had definitely put us in position to win the championship. We had seven wins over a bunch of different types of tracks. “It’s hard to believe the season is over, to be honest,” he said. Theriault became the first driver in 65 years of ARCA competition to win on all of ARCA’s track types and disciplines in a single season. He said the end of the season is “almost bittersweet. Team owner and former Monster Energy driver Schrader had lots of praise for Theriault. “He led from the first race on. 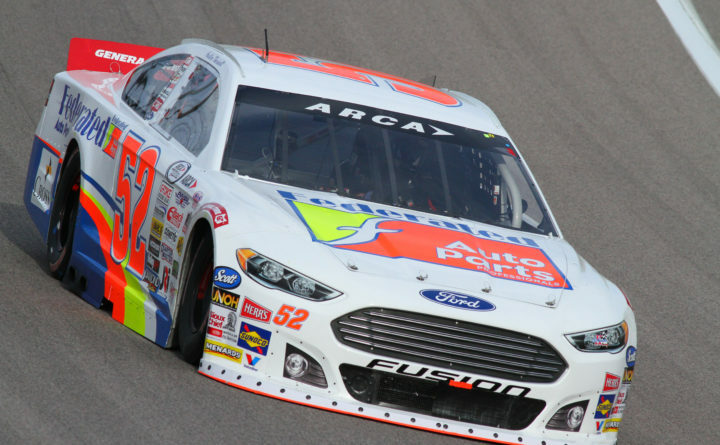 He never gave up the points lead … that’s pretty rare in this business, if ever,” said Schrader on the ARCA Racing website. “We had two bad runs where we were sixth and ninth. That isn’t exactly terrible. Theriault won the first race at Daytona International Speedway and never looked back. “We certainly had some tracks we struggled at but we tried to get better at them. We were good at the short tracks and dirt tracks and we overcame our challenges at the bigger, intermediate tracks by winning at Kentucky a couple of weeks ago,” said Theriault. He enjoyed driving for Schrader and crew chief Donnie Richeston. “Ken is a good owner. He let us do what we felt was right for the team. He didn’t micro-manage which is always good. He trusted us,” said Theriault. Theriault doesn’t plan to take much time savoring the title. He said he would like to secure more sponsors. “I feel like I’m taking Business 101 and learning marketing and all of that stuff,” he said. Theriault said he thoroughly enjoyed racing for a points championship and running on a regular basis rather than the part-time deals he had in NASCAR’s Camping World Truck and Xfinity Series. He wouldn’t mind going back to Schrader Racing and running in the ARCA series again but he would also want to supplement it with some other races. He also said he wouldn’t mind part-time rides in a couple of different series as long as he gets to race on a regular basis.